Ala Moana: Wave heights only around 2 feet tomorrow and Saturday. The highest may be around 3 feet briefly. Makapuu: Wave heights around 2 feet tomorrow and Saturday. A few sets may top 3 feet very briefly. Sunset Beach: Waves heights 1-3 feet tomorrow and Friday. There is the chance for 5 feet beginning Sunday morning. Makaha: Wave heights 1-3 feet tomorrow and Saturday. 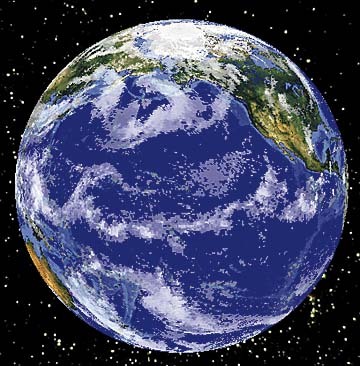 Coastal waters: East winds tonight and tomorrow at 12-25 knots. Waves 4-8 feet. Channels: Winds east at 20-25 knots tonight and tomorrow. Waves 8-12 feet. 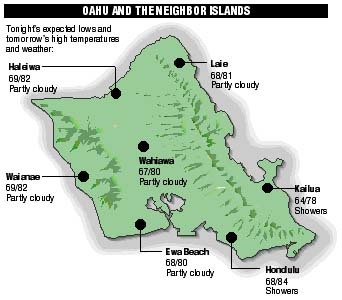 Big Island: Hilo - Showers tonight. Low 66. Tomorrow, some sun and a morning shower. High 77. Kona - Fair tonight. Low 64. Tomorrow, sunny, breezy and warm. High 78. Maui: A few windward showers tonight. Lows 62-66. Tomorrow, sunshine. High 78-86. Kauai: Mainly clear. Lows 68-74. Tomorrow, sunshine, windward showers. High 76-82. Lava is flowing to the sea through underground channels, but none is visible on the surface. Moonset tonight -- 4:22 a.m.
Moonrise tomorrow -- 6:07 p.m.
Fri.	2:34a.m. 0.8 ft.	8:26a.m. -0.2 ft.
3:38p.m. 1.9 ft.	10:30p.m. 0.2 ft.